I have been trying several different platforms to find a good fit for offering downloads of the type of 3D models I create. I make electronics cases, wearable designs, sculptures, figurines, 3D game/world assets and more. Rather than jam these all into one platform, I’m finding what options and audiences each platform offers and tuning the content to match. I have variety of free (reduced resolution) sample figurines and cases for classic electronics like Raspberry Pi and Arduino on Thingiverse. CG Trader, a Lithuanian company, is a platform that also offers models for rendering and animation, so the models there will often have textures and other additional features beyond the basic STL found at most 3D printing oriented site. I also tried Patreon, but a flaw in their system allows people to temporarily subscribe, scrape all the content from a creator, then cancel before making any contribution. That system may work for some but I found it wasn’t appropriate for my work, and I’m hearing a lot of complaints from other creators. Maybe they will improve in the Future. At this tier you’ll receive several new designs per month, as well as access to all previous designs released at this tier. The figurines at this tier feature basic editing to ensure printability, and enough detail to print around 6″ high at the resolution of a typical home printer. Editing scan data is a lot of work. At this tier, scans have had 2-5 hours of editing to enhance detail. 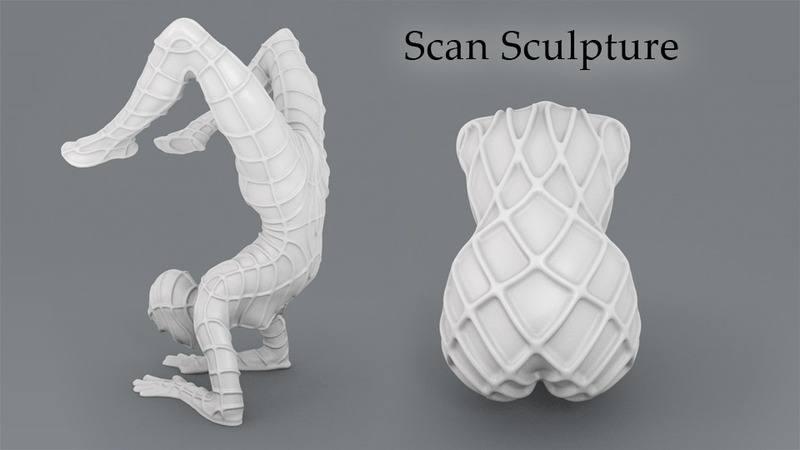 These scans are optimized to fill print around 8-9″ tall. Manual support structures are often added for easier, more reliable, higher quality prints. Wearable tech packages are more complete with a variety of options included. 1 Wearable tech variety archive with at least 4 variants included. This tier features fully developed avatars/characters with complete outfits. Professional quality. These are delivered in package with a variety of 3D formats, part configurations, and polygon counts. These include versions that take advantage of multi-material, dual extrusion, or full color printers. In addition to figurines and wearable designs, I also create original work based on the scans. 1 new sculpture per month. This is a blog post I wrote for the OpenBCI Kickstarter. Designers who create products that function on and around the body have long used statistical measurements derived from anthropometric studies. In cases where custom fitting is impractical, the goal is to properly fit as many people as possible, perhaps offer a selection of sizes or adjustment functions for fine-tuning. For the Ultracortex project, it was apparent that simple measurements like head circumference were not nearly good enough for our purposes. One of the most important features of the Ultracortex is the accurate electrode placement, which uses the 10-20 research standard. 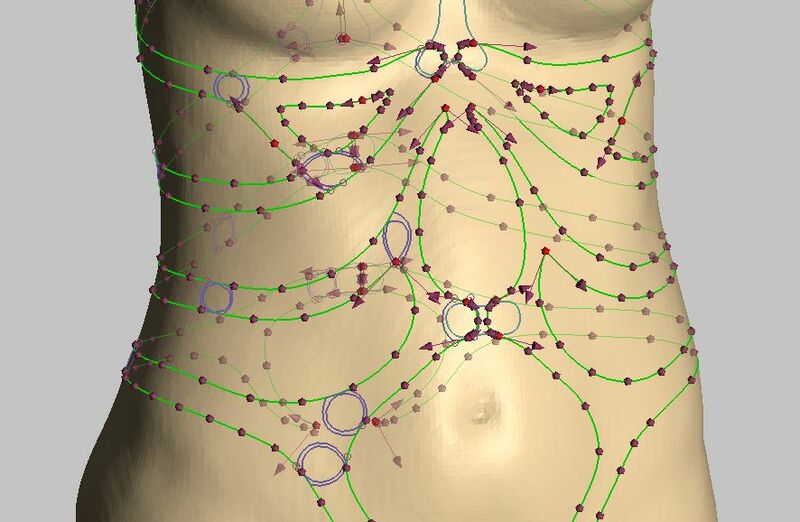 This establishes the locations of the electrodes using a parametric definition based relationships between key dimensions, much like those used in CAD software. The system is defined by starting with two anatomical reference points, the Nasion (the depression at the top of the nose) and Inion (the bump at the back of the skull). From these points, a series of divisions of the connecting lines establishes the electrode locations. A research-grade system would require these measurements to be taken on the scalp during set-up, which is a time-consuming and laborious process. 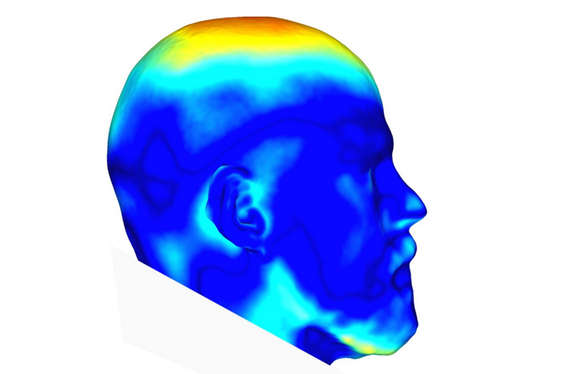 An EEG headset is much faster than manual placement, but often compromises the accuracy of the locations, and so affects the accuracy of the data. To make use of the vast quantity of research data collected using 10-20 system, the electrode locations need to be as accurate as possible. In most cases, flexible arms or stretchable fabric is used to roughly approximate the placement. The trade-off of fast set up time for accuracy is often worth it. 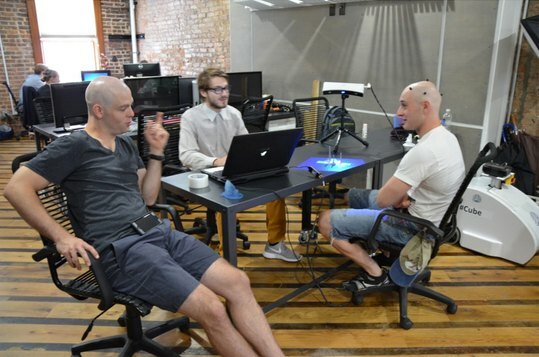 OpenBCI needed a headset that would be part of a platform which can be used as a serious research tool. While the application is more rigorous than a toy or game interface, it still needed to be quick and easy to use. 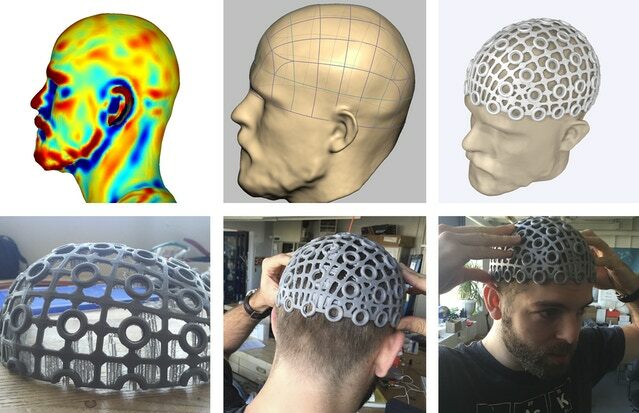 Accuracy and stability of the electrodes was given a very high priority, along with the requirements that the headset be comfortable, fully adjustable, and finally, it needed to be produced on a desktop 3D printer. Bringing all these components together in one design, the Ultracortex was born. We had considered using available MRI datasets, but they tend to be fairly low resolution (256^3 voxels), and they often crop out the scalp, since the brain is the area of interest. Surface scanning is far more accurate and using this approach, and we were able to establish electrode locations with precision of better than a millimeter when using highly accurate white-light scanning. I happened to have my own head already scanned from a previous project to get the ball rolling, but to create our database of head to average together, we sought out volunteers willing to shave their heads for scanning. We made an effort to get the most diverse set of samples possible. 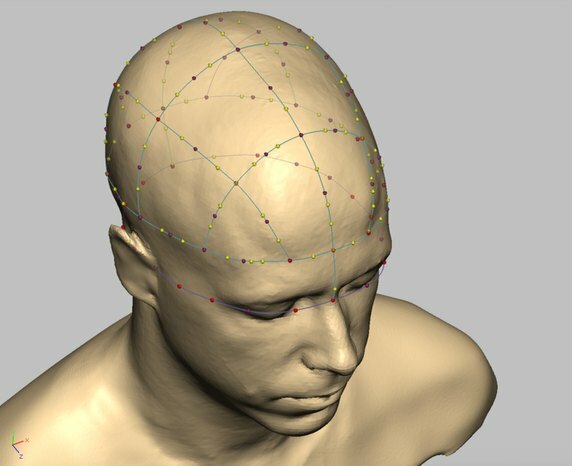 Moving forward, we will increase our head-scan database size and consider any other factors we can find that influence function and comfort, such as hair styles and different types of electrodes. We are very excited to have the opportunity to also design fully custom headsets, which frees us from the constraints of general fitting, and allows us to truly focus on getting the best possible performance. In some cases will also have MRI data to target particular brain regions as accurately as possible. We have already done preliminary analysis on general datasets measuring brain-to-scalp distance, to get as close as possible to the area of focus. 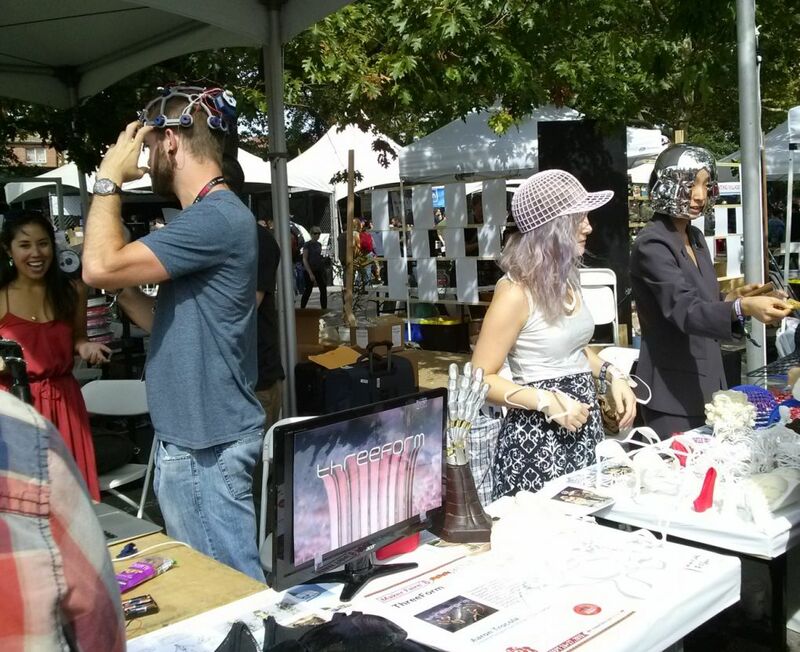 For World Maker Faire 2015, ThreeForm and OpenBCI had neighboring booths because we’re showing a new collobaration: The Ultracortex EEG headset. OpenBCI makes a medical-grade bio-measurement device used primarily for brain research. Since the raw OpenBCI electronics need a housing and connections to become useful, Conor and I are continually refining a 3D-printed headset design so that customers can purchase the OpenBCI board and print the headset themselves, or buy it at an affordable price. This year Heidi Lee joined me at my booth as well. I invited Bre Lembitz model the headset (walking around the show with micro-camera on her head as well, ha), and Mel Ellard greeted visitors at the booth. Later, Conor of OpenBCI gave a presentation demo where he operated a robotic arm using the headset – always a crowd favorite! 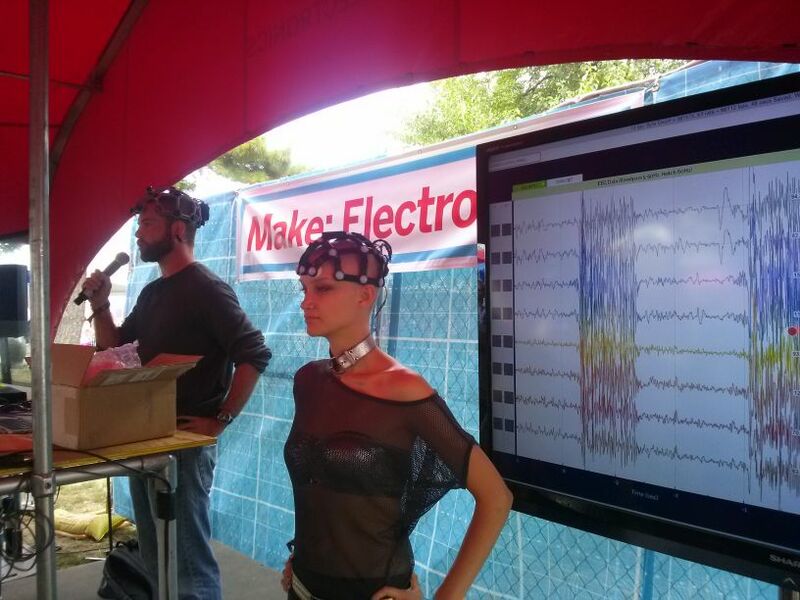 Both ThreeForm and OpenBCI managed to take home Editors choice awards this year as well. The field of development known as “Wearable Technology” is suffering from a labeling issue. The technologies referred to are usually specific products that are not just wearable, but must be worn. They are designed to function in the context of the body. What constitutes “technology” is also fairly vague, since the phrase refers not just to electronic gadgets, but all sorts of innovations like specialized textiles, materials with engineered properties, prosthetic devices, or sensors and displays, in addition to “smart” products that have some level of computational ability and often communicate with other technology. I’ve broken down Wearable Tech into categories to provide an organizational framework for my work in custom-fit 3D printed products before, such as in my presentation at the 2013 Rapid convention (PDF transcript, video). Rather define these things for the audience every time we mention or discuss this family of technologies, it would be much easier to find relevant sub-sets that can be grouped under a single label. The phrase I use to describe my area of work is “Digital Apparel”. Of the many word choices available, “apparel” from the Old French “apareillier”, meaning “to make fit”, is an ideal choice to pair with the digital and technological processes that distinguishes the subject. Digital Apparel includes a collection of information that defines a product worn on the body. The definition includes a three dimensional geometric definition that can be adjusted for different individuals. 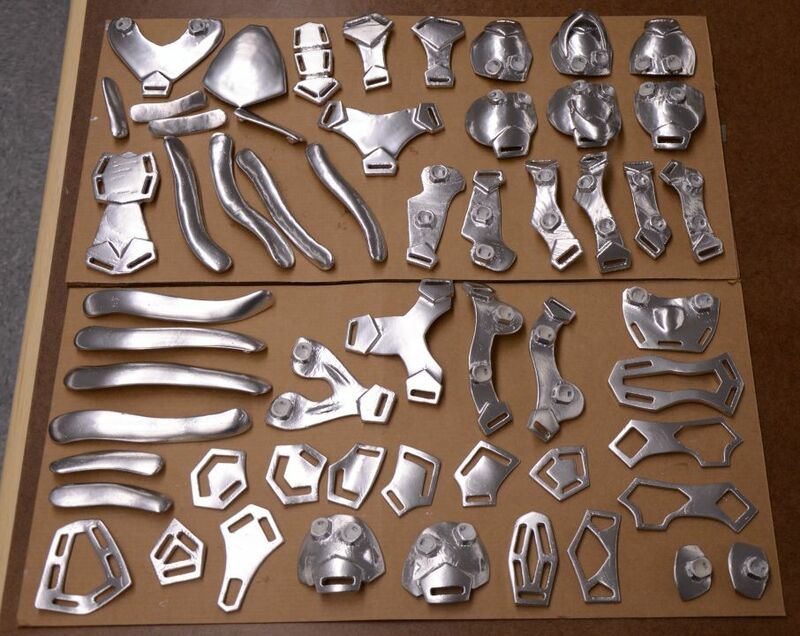 Customization can be defined through simple sizing variations or through parametric and generative components. In addition to geometry, an Item of Digital Apparel must be designed with specific processes and materials in mind, and specific intent in terms of function and aesthetics. It may also include transformational, iterative, or reactive geometries which are currently being covered by the oddly chosen phrase “4D [printing]“. The final criterion is that the product is made primarily through industrial processes. Is Digital Apparel clothing made on the computer? It is the definition of the “clothing” while it is still on the computer. After production it is currently called either clothing (apparel), or wearable technology. 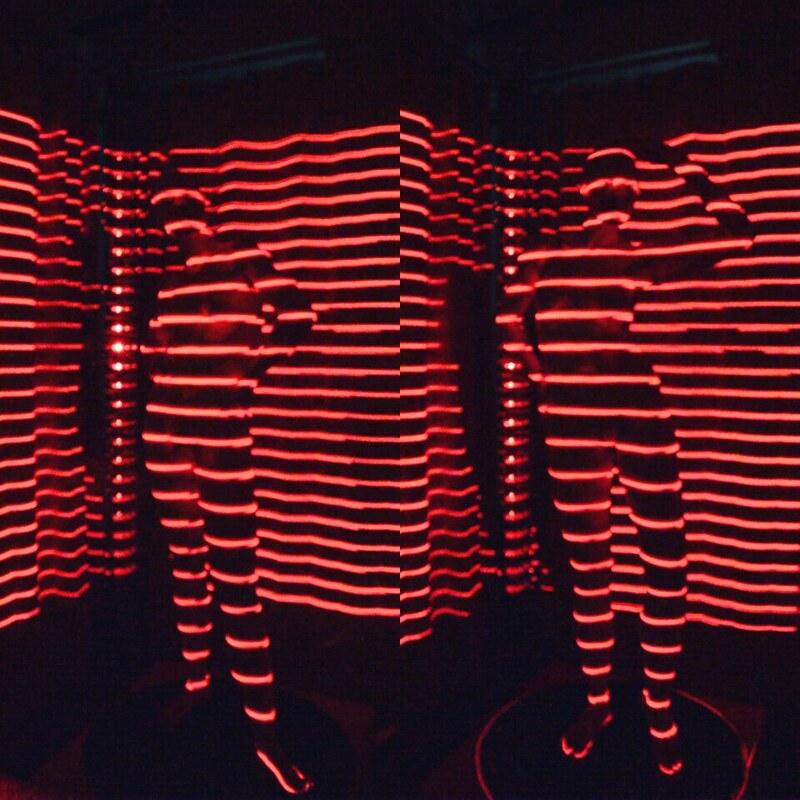 Is Digital Apparel referring to designs for 3D printed clothing and wearable technology? It can, if the definition of those things is complete. Most advanced commercial wearable technology is produced along with PLM (Product Lifecycle Management) systems (Such as the ones from Siemens that work with their NX CAD software), and so contains the required information to meet the definition. 3D printed clothing is usually just a static 3D model, but if all the requirements are completed, such as a selection of sizes, and design for a specific material and 3D printing process, the design will meet the definition. As a simple example, a 3D design for something like shoes or a hat in a selection of sizes (while maintaining all key dimensions and features), designed with appropriate tolerances for FDM printing in PLA on a home printer, would meet the definition. What about simple items like jewelry? While they could be available in sizes and have material and process specified, the spirit of the definition is geared toward enabling discussion of pieces that distinguished by having larger size or complex shape that necessitates accurate size and shape, or specific functional requirements that require some knowledge by the designer about the context on the body. It also meant to refer to objects that are not purely decorative (have some technology component), so this usage would not be appropriate. Smart watches and necklaces have tech, are they digital apparel? Wearable technology, while an awkward phrase, is most pointedly referring to these gadgets, so that is the more appropriate phrase to use. If you wouldn’t call the resulting product “apparel”, you probably should not call the design an example of Digital Apparel. There is not a hard line between them however, particularly because the digital design and customization allows many more variations of form that don’t fall cleanly into categories like “Shirt” and “Pants”. I do think the Digital Apparel definition should be extended to forms that do not entirely envelope the torso, and so in some sense could be called “Accessories”, though that term is broad enough that it also refers to very small items. The phrases are not exclusive, but refer to different things. The core features of Digital Apparel are the customization and production information aspects that accompany the design intent. Are there examples of of on the market already? Yes. 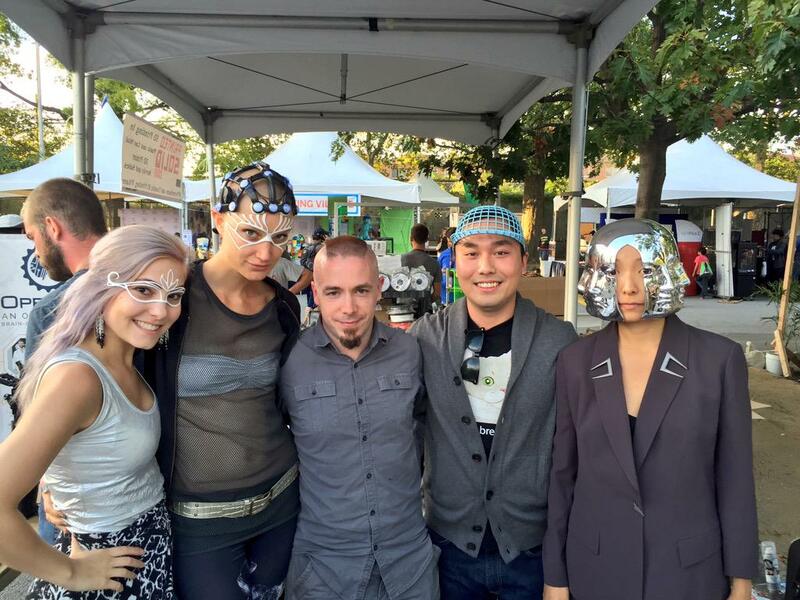 I offer 3D printed accessories and garments that are customized based on body scans and manufactured via 3D printing. 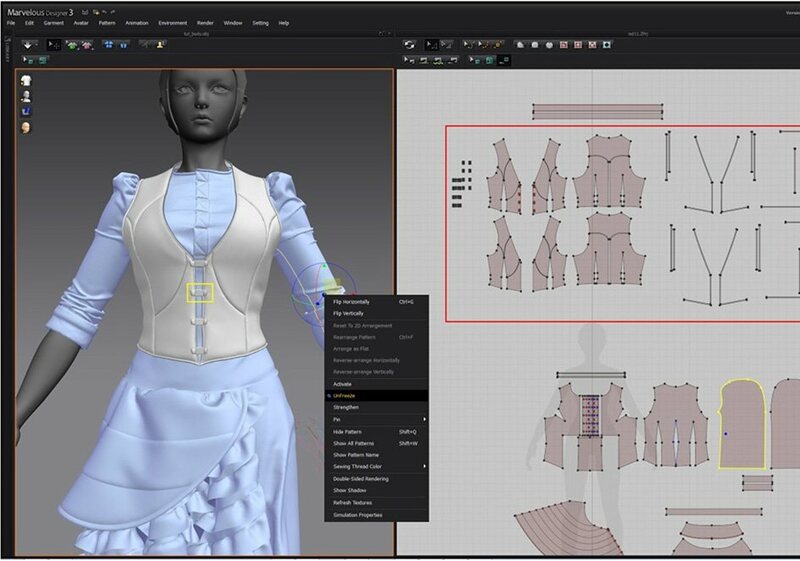 There is software on the market such as Marvelous Designer that can be used to create a 3D dimensional design and output to 2D patterns for production. These patterns are cut through CNC, but are still assembled by hand, which falls short of being produced “by an industrial process”. However, there still can be no hard line, since even 3D printed designs are partially processed by hand. The important characteristics that helps distinguish Digital Apparel from traditional manufacture are the production specifications; which material, how they are cut and assembled- all of that information is needed for a complete Digital Apparel design. Doing something like downloading a 2D pattern, manually cutting the cloth and assembling it does not meet this definition. Aside from the fact the re-sizing would require experienced knowledge of the craft, there are numerous decisions made by the fabricator that would produce variability from one producer to the next. There is currently a fully automated robotic assembly project sponsored by DARPA for producing military uniforms that are custom fit for each individual. This would be an example of a Digital Apparel system. There are also several 3D weaving projects and 3D printing projects (such as the work I do with ThreeForm) that are carefully designed to be produced as repeatable, variable products. They are rare and expensive, not yet in mass produced form, but I would count them. One can also find examples of Mass-customization online, such as systems from Nike that create customized designs through a web interface. As final assembly of these products becomes more automated, the results become more pure examples of Digital Apparel. 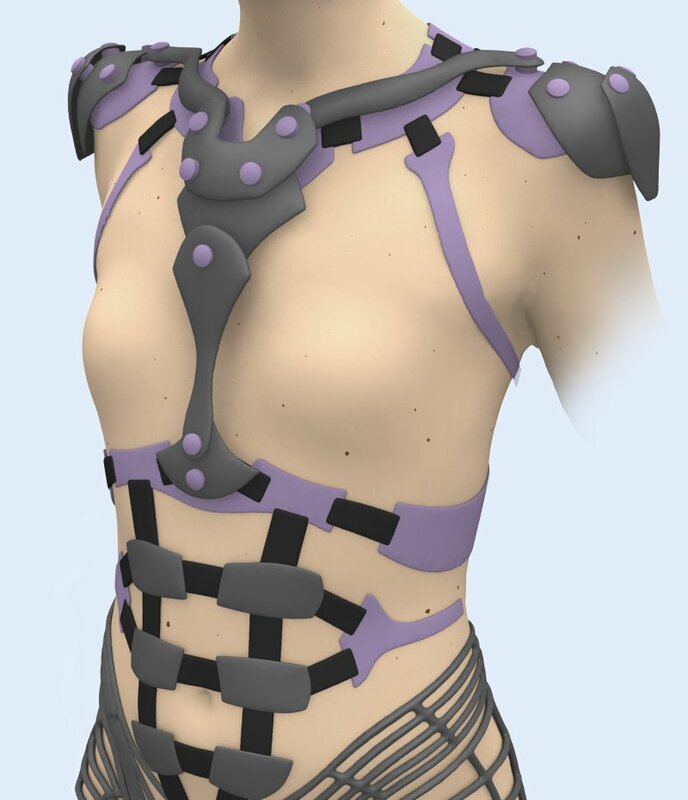 If I extract an outfit from a video game for example, size it to myself, and 3D print it, is it Digital Apparel? No. The model would have to be thickened and heavily modified in many ways to make it print and function. All of that input requires planning and design to match with particular materials, processes, and functionality of the result. It could be possible for a designer to formalize this information and creative a derivative work which is Digital Apparel, from just about any geometry they choose, as long as it meets all the criteria. Is Digital Apparel a format? No. There are a number of systems available for managing product information, and many of them pass on production information to the manufacturer. Again, this is not a black-and-white distinction, since for example a whole line of products might be designed to print in nylon12 using the common selective laser sintering 3D printing process. The actual process and material selection is inherent in the product and planned by the designer, but the producer may only offer that one choice, so there is no need to specify in any digital file. It should suffice that all the implications of the production process were planned by the designer to achieve a specific result, and as long as the design is “fit for the environment” that it is released into, it will successfully meets the definition. How would anyone know what formats and software to use, and how to communicate the correct information? Right now, all that is required is for the files to be compatible with the equipment, and all relevant information to be communicated along with the file, whether grouped into an archive and sent via FTP, transferred via a PLM system, or simply communicated along with an email attachment. Standards have not yet been created, and all of these things are adapted to the context, which is why this is not a consumer-level activity at this time. What are the next steps? When do consumers get to buy Digital Apparel? They can right now. In addition to hiring a specialist to create flexible digital designs, companies are creating software to simplify various parts of the process. The New York company Body Labs has a system that makes it simpler for companies to get input from customers to do customization in a less ‘couture’ arrangement. Ultimately we will all have digital profiles that are compatible with online shopping systems that will place orders and begin to manufacture customized garments – often with integrated technology components – with very little effort and relatively low cost. The tension between the selective forces comes from the fact that those systems work best when many people wants the same thing, and customization works best when the customer wants a different thing from what is being commonly offered. I feel there will always be a spectrum of solutions, from the mass-produced simple functionality like a custom-fit piece of clothing with a simple sensor or indicator, to completely bespoke “wearable systems” that may enable complicated sets of interacting functionality, such as treatment for health issues or enhanced capabilities. At the extreme end of this development one might have most of their biological and functional needs covered, as in examples where a scientist might explore a remote area or even another planet. All of these products that interact with the body must meet certain requirements to begin to evolve toward these final forms. Leaving out any specifications means work must be repeated for each iteration, and much of what was learned might be lost. It is by formalizing communication and design technique that standards will emerge to push forward development of both wearable technologies and Digital Apparel. On May 13th, 2015, I participated in Silicon Valleys first “Fashion Week”. It was held by an innovative clothing retailer called BetaBrand. The show was tremendous fun, and had a free-wheeling vibe very much unlike any fashion related event in New York. It was geared toward the tech and counter-culture types one finds in the bay area. I heard some comment that this event had the generous ratio of women to men of any tech event they had ever attended. The venue held only 500 for this first-year show, and the tickets quickly sold out. The waiting list on the Facebook event page was over 4,000! 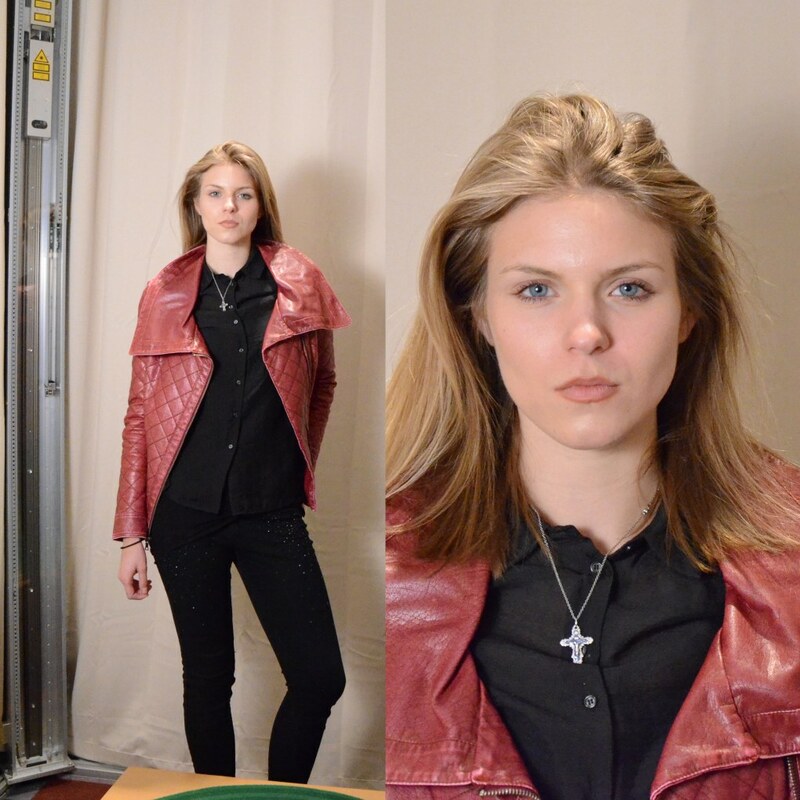 Here are some images of my work in the show, and afterward with Jasmine, who is wearing the Roman top. 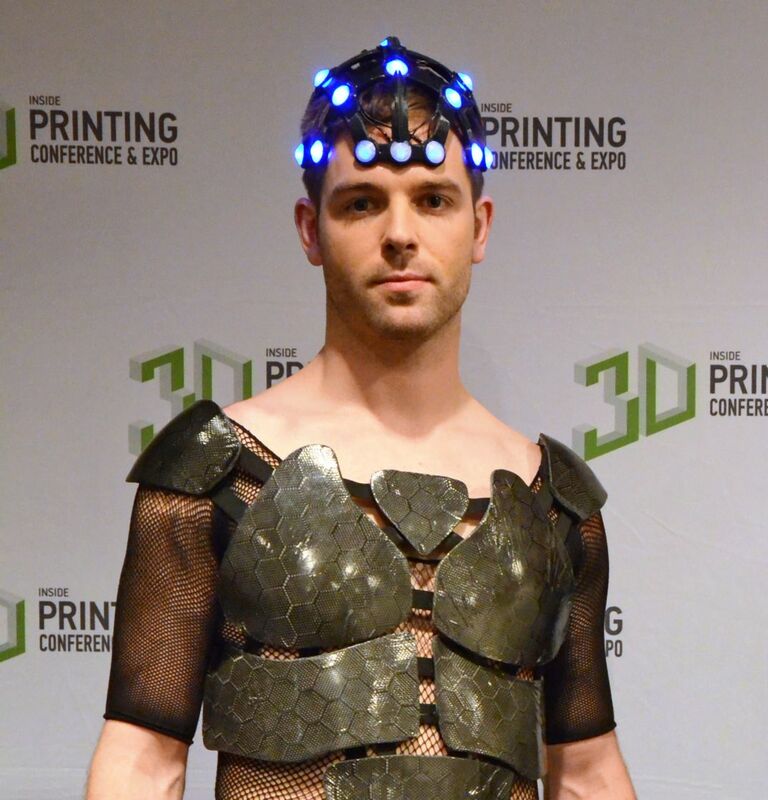 On April 16th, 2015 at the Jacob Javits Convention Center in NYC, the Fashion show at the Inside 3D Printing Conference was held. In addition to myself, designers such as Heidi Lee, Rachel Nahn, Dilek Sezen, and several others participated. 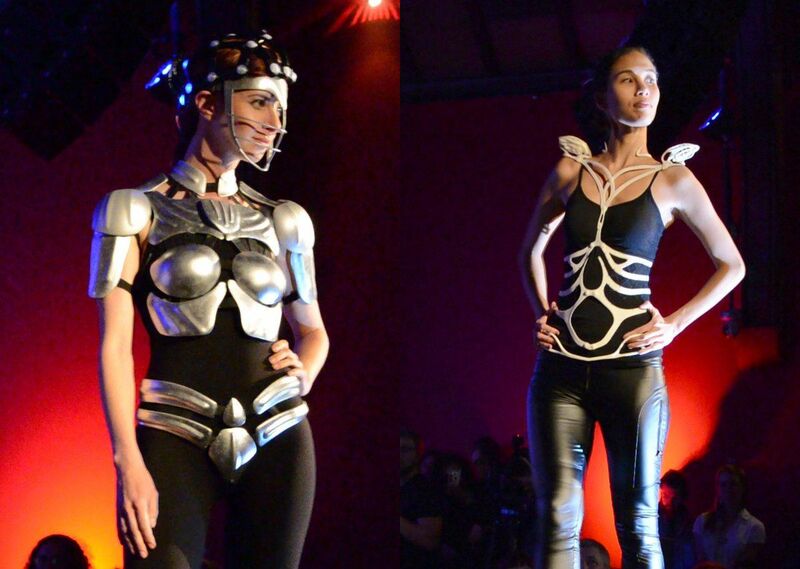 Like many of the other 3D printing fashion shows, it was funded in part by Materialise. Here are some photos from Sai Mokhtari at the Gothamist. Here are some Photos from after the show. First, Conor wearing his custom carbon-fiber/kevlar armor made on 3D printed molds, fabricated by Seth Kane of New Flesh Workshop, and Nova Wearing the Echo Hat I made with Heidi Lee along with some Art Nouveau “Anti-armor” lingerie. Conor Wearing the M1 prototype and custom carbon fiber body armor. Nova wearing Echo hat and Art Nouveau lingerie. I am closely involved in organizing the upcoming fashion show at the Inside 3D printing conference in April. 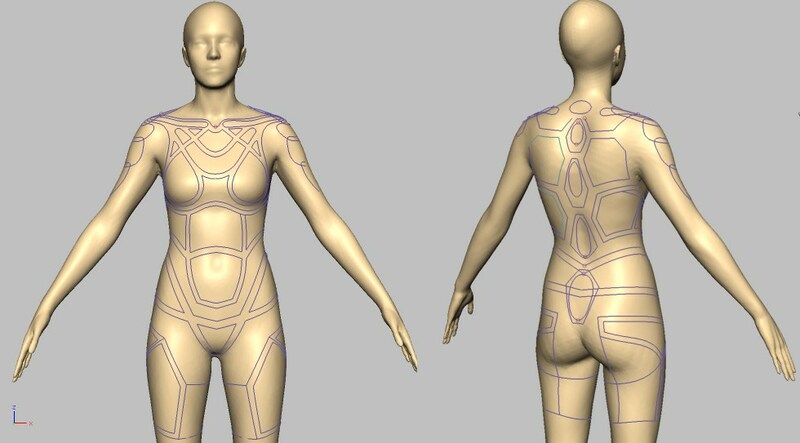 I’ve already cast a team of models who are being scanned to create custom 3D printed outfits. Here, we see Mel and Shelly Lynn being scanned over at Body Labs. The scanner Body Labs uses at their office is an 0ff-the-shelf laser scanning booth that was originally designed to measure soldiers for Army uniforms, I believe. While it is not extremely detailed, it is very fast, scanning top-to-bottom in just a few seconds. Most models were scanned 10-20 times, but Mel and I spent a good couple of hours and kept having ideas. We created more than 100 scans – a marathon session for sure. 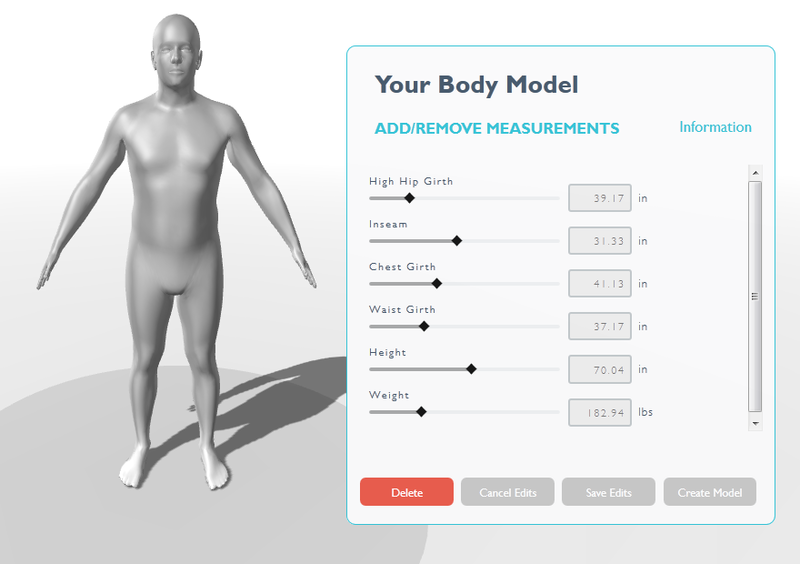 All of these scans have been added to the Body Labs database and are used to refine their algorithm to create more accurate body shape and pose estimations. Obviously this technology is great for customizing designs, but a more short-term goal is for us all to be able to go shopping online with our digital profile and be sure that everything we buy will fit perfectly. Another unique capability brought by the pose estimation algorithm is that it enables a point-to-point correspondence between subjects. That means that measurements can be compared between individuals or the same individual in different poses. 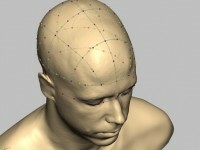 By adapting a generic mesh to the shape and pose of a scan subject, the mesh can be adjusted to match, thus creating a digital avatar that can be posed and animated. By applying this process using the same input mesh, the output avatar is topologically consistent between individuals. By having the same structure, the avatars – or designs created from them – can be morphed and blended. Below is a demonstration; a continuous morph between all models in the entire team. 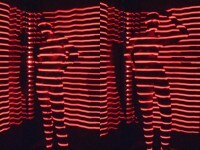 This body-morphing ability was later used to good effect during the show. Since some parts of the lineup were not predictable (in terms of which model would wear which piece at one time), it was desirable to create generic accessories with a high likelihood of a good fit. This was done by population averaging of our team. Runway models are not average compared to the US population – they tend be tall and slender. By averaging them together I created a virtual model (dubbed “Ave”), which I used to create general-fit designs. I later gave a presentation explaining this process, as well as cranium averaging used for the Ultracortex project, as part of the proceedings at the Rapid 3D technology conference. The presentation was called “Reverse Engineering The Body For Product Design”. On September 8th, 2014, fashion-week once again rolled into New York. As part of a week-long series of art exhibitions in Times Square called “Art-a-porter”, Heidi Lee and I presented some new work in a very unique way. Months earlier, after running through a few concepts and gathering a team, the project evolved into a unique hybrid presentation that was both runway show and video shoot. By that I don’t just mean recording the proceedings, but actually a full FX shoot with 3D tracking and green screen background. The idea was to capture the models performance and digitally re-create a new environment around them (in our concept, an other-worldly temple), then present the results as a commercial for the pieces. We had Andrew Strasser as our director of photography doing some nice steady-cam shots, and myself doing some auxiliary tripod shots, as well as two photographers documenting with still shots. In addition to providing some 3D printed parts for the teams outfits, I also did the production management, making sure we had all our ducks in a row with logistics and other resources, since this was a very public show and we had specific requirements for the shots to be usable for 3D compositing later. 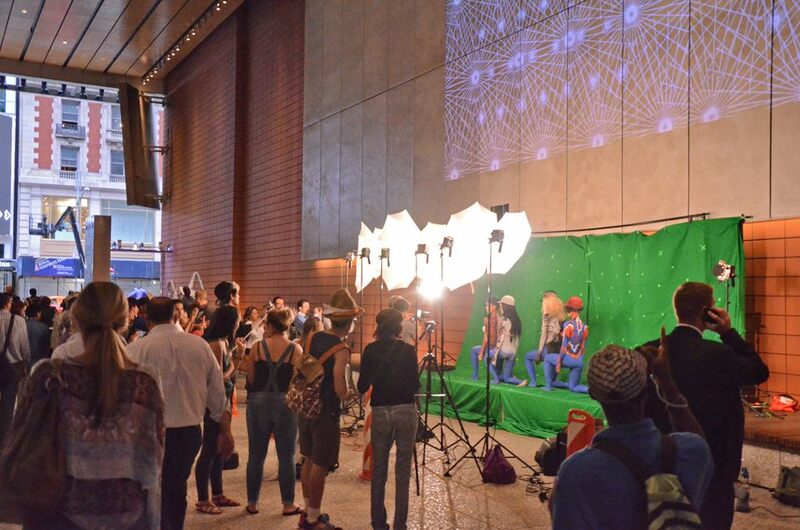 We worked with body painter Dani Fonseca of The Body of Art to create “outfits” made of paint and 3D printed parts. These were all in line with a color scheme reflected in the hats. It took Dani and her team the entire day to paint the lovely models we had selected for the project, and so they made the trip in full paint across town from the studio. I was not able to get scans of the models beforehand. Relying on measurements and photographs, the parts were sculpted to fit and flatter. The parts were attached with adhesive and painted over to integrate them into the overall look. Compositing test on stone background. Lovely Nova gives us an anatomy lesson. This project was definitely a stretch to pull off, but the results are worth the effort. When so many challenges are overcome in a project, it only makes it more satisfying in reflection. This was also one of the most fun, free-wheeling creative projects I’ve worked on in awhile. We were fortunate to have such an understanding and flexible host in Susanne Bartsch, the producer of Art-a-porter. The plan changed numerous times as the work progressed, and this one of those precious few spheres of life where the evolution of ideas is accepted as an inherent part of the process. For the opening of the 2014 New York 3DPrintShow Fashion Show, five gymnasts of the Purple Knights gymnastics team put on a choreographed dance performance to open the show. 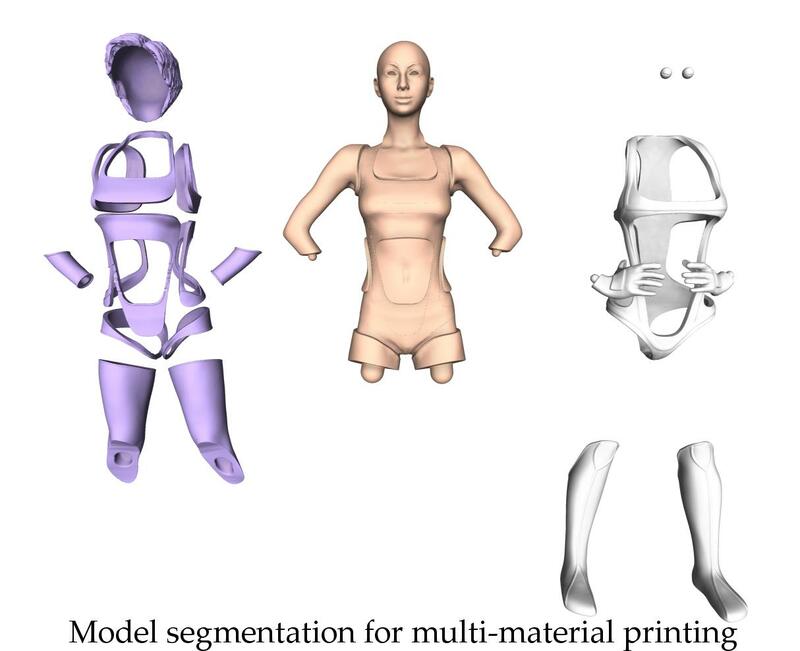 For this 3D printing fashion show, custom performance outfits were created for the Purple Knights based on their 3D scans. After working with the gymnasts of the Lady Knights on an earlier promo video, we discussed making some customized accessories to bring a bit of theater and artistry to other shoots we had planned. The coach liked the sound of it. He asked about some other possibilities, and if they could perform wearing them! We had of course ruled out anything that could jeopardize a meet, but the challenge of designing for such exceptional requirements was an exciting prospect. Since I specialize in creating dynamic wearable 3D printed garments that allow the body to move freely, this was a perfect opportunity to tackle a really difficult goal. After floating the idea with the team at 3D Print Show, they were intrigued enough to consider devoting a segment of the show to a live performance. The initial concept for the Purple Knights Armor was fairly simple- I wanted to show these graceful, powerful athletes doing their thing, and accent it with some armor-like designs that confer a mix of organic and mechanical references. There are also some more subtle components of my work in general that I’ll elaborate on in a minute. While custom armor is simple by itself, the original designs carried a lot of other ideas along and included far more exotic construction. I initially looked at DMLS (laser-sintered) titanium, but that process is actually very limited because it needs lots of support material. That material is hard to remove from any shape but especially concave/hollow ones. While I might try that if I had access to one of those machines, the cost to outsource would be somewhere around $200,000 for each outfit, and that’s more than I was hoping to spend on this project. Considering other processes, I had the idea to first print the parts in acrylic resin using the SLA process. Those finely detailed parts were to be electroplated with a heavy coat of copper, then nickel. After removing the resin (and undergoing a few other processes), the metal shells were to be given a structural coat of Titanium. Finally, a new process I heard about from Material Connexion involving a crystalline growth of sapphire over the surface, which makes it scratch resistant and naturally antimicrobial. The lining would have been Bamboo fleece. I was also looking into an additional external layer made of an aluminum-ceramic composite. One of the reasons the outfits look the way they do is that they are actually the middle layer between the lining and exterior plates. Most of this did not make it into the final design, but as a concept, ultra light-and-strong Titanium Sapphire Armor is exactly what I was looking for. Combine that with the incredible athletic abilities of the Gymnasts, and you have a recipe for awesomeness. It would have been great to have more time to refine the designs, but I consider this a step in a long development process, so I’m happy to let people in on the early stages. One aspect of the show I’m most proud of does not even involve the designs, but rather how the performance relates to the context of a fashion show. The contrast between a gymnast and a runway model is pretty obvious. These girls are barely over five feet tall. They have about average body-fat percentage, but they are wrapped in a layer of muscle (30 hours a week in the gym will do that). Despite not fitting that imaginary “Ideal”, they are ideal by many other definitions, and that should be recognized. As an aside, a very well known NYC designer launched his fall collection recently along with a video to try to capitalize on this envy some people feel toward athletes for their impressive physique and performance, but he did this by showing extremely thin models holding sports gear and standing next to equipment like weight lifting machines, when the person in the picture looks barely capable of holding their own weight. I think an exceptionally slim person can still be attractive, and the models are often beautiful, but associating that body type with athleticism is unrealistic. To associate it with health and fitness is downright irresponsible. Body-types and other beauty standards have always been strictly enforced in fashion, and while some of it is practical (standard sizing), it is mostly a cultural echo chamber that has drifted far from the reality of what most people find attractive in today’s culture. I am proud to use diverse models in my work that reflect the reality of the world today. When clothes – and many other products – are customized for each individual, the reviews and opinions of media suddenly lose purpose. The old system of relying on magazines to give you your opinion is too slow to maintain an edge, and online versions of the same cannot differentiate themselves with better content than casual bloggers. You don’t need to know what’s “In” next season when what people want to wear was designed the night before. Further, the cultural innovations that inspire new designs are often produced by individuals that are not designers or celebrities, and are certainly not marketing people pushing viral content for brands. They may get clicks, but will have a hard time converting that into sales. Today’s audience is just too media savvy for old strategies. Companies like Zara have already blown holes in the strict chronology and hierarchy in the season/branding structure and I have heard no strategy to address it but the same focus on brand exclusivity. The same tribalism and desire to imitate that served fashion during the last century may make it impossible to maintain brand value on style alone. Fashion was only “invented” in the 19th century when garments began to be mass produced. If we don’t need to worry about inventory, no bets need to be placed on upcoming styles. With the exception of a few brands that can rely on steady sales of their classic products, that leaves few options except to innovate, and to offer customization and a few other creative value-add mixes of product, service, and experience. 31 Lady Knights of the Purple Knights Gymnastics team. I got to see the gymnasts in action during their practice in December, and later as the competitive season began in January. Documenting the season for the final video a few months later, I got to know a little bit more about the team, how they interact and work together, and more about the sport. Observation is an important part of the design process. When I speak of customization, I’m not just just referring to the shape of the body, but obviously I want the results to carry a bit of the wearer to the outside. I try to avoid doing this in a literal way with obvious references, but opt for subtle connection of form or symbolism, unless it serves an immediate goal in use or presentation of the design. One thing that stood out to me initially was the frequency and severity of injuries. Gymnastics is dangerous. The forces involved are great, and the routines can contain very complicated sequences. The smallest mistake is usually unrecoverable, and can not only harm the performance of the whole team, but cause serious injury. It is a lot of pressure to perform under and the team has been doing it consistently for years. The Purple Knights gymnastics team had won the USA Gymnastics National Championships and the East Coast Athletic Conference Championships for five consecutive years, and since that time have gone on to their sixth straight win of each. That consistency made me confident they could handle what we were planning to do, but I was also now keenly aware that there had to be a certainty that the design would not impede the motion of the performer. The design needs to be able distort easily, and even break or reconfigure if snags or extreme movements create pressure that could alter the path of the performer or her limbs. I also didn’t want the embarrassment of the design disintegrating in mid-performance in the case of a problem, so a further requirement was that if the design is distorted out of shape (reconfigured), that it automatically return to it’s original shape when possible. For every design I’ve made so far, I’ve designed or modified different types of fasteners. Eventually I may have a full library of whatever I need, but right now everything is very custom. 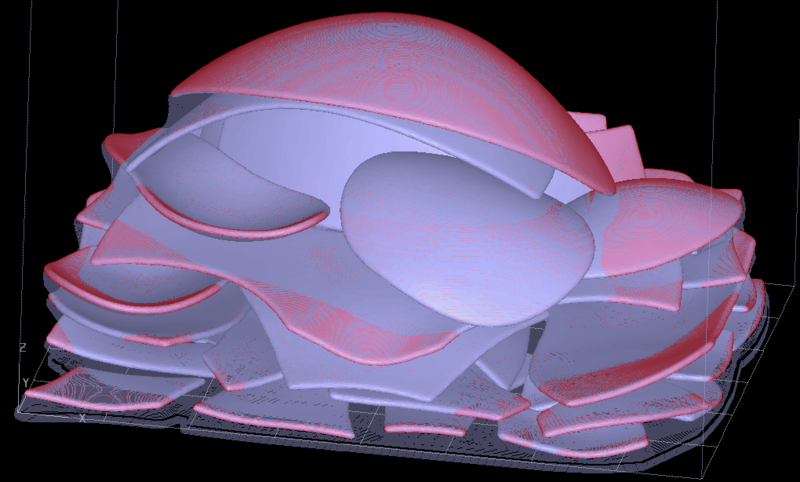 With a parametric model, variations of new designs are easily produced, being sized, shaped, and angled for different parts of the design. After doing some rough math to analyze counts of connection points, fasteners, overall number of parts, volume, and time to print and finish, it was obvious that 6 weeks was simply not enough time to complete that many outfits. I really like the cross-stitch style I had used for some of my earlier designs because it is effective at resisting side-to-side motion while allowing stretching between panels. However, assembling the garment would be too time consuming and delicate for that many outfits under those conditions. Fortunately Manhattan’s fashion district is right nearby so I could get a hands-on look at other options. I also met with Becca at Chromat to discuss a project, and she gave me a review of some of the joining methods they use there. I switched to wide elastic straps instead of cord to join the sections, but used heavy cord for inter-layer connections that need to allow short-range out-of-plane movement. To actually join the straps, none of the stock detachable connection types appeared reliable enough for performance. The obvious solution was to sew the connections, but I would prefer the design was adjustable. 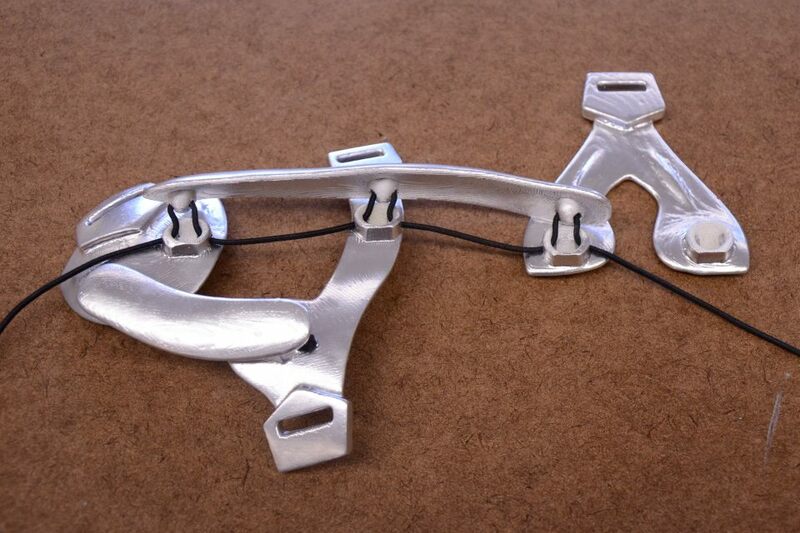 The solution was found in an adhesive from 3M designed for assembling racing sails. It was very strong, but could be separated and re-attached by hand if needed. Of the 31 gymnasts on the team, 9 signed on to be scanned. Shortly before the first scheduled scanning date, the gymnast doing the choreography was injured at a meet. She stayed on to direct the team but obviously could not join the show. The remaining 8 were given full body scans using the fast, portable M3DI white-light scanner. This type of scanner is extremely accurate, and usually used for industrial part inspection. For comparison, this scanner is accurate to about 0.1mm, compared to ~1mm for a typical laser scan, ~1-10mm for photogrammetry, and ~10-20mm for PrimeSense (Kinect, Sense, Structure). Each scan can create millions of data points, resulting in several gigabytes of data per person that must be processed through a pipeline of scripts, passing the scan sections through various stages of cleaning and reduction. They are all merged into individual bodies, and all the original color samples are projected back onto the skin. 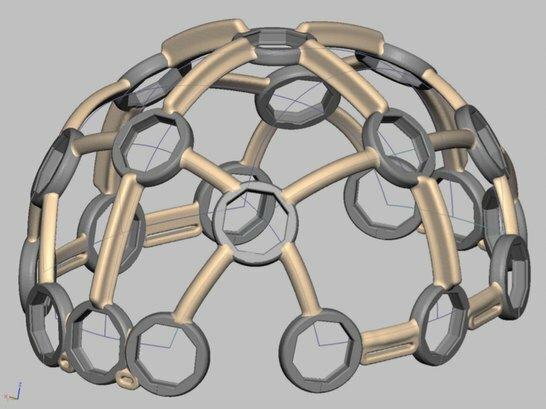 To converge on a realistic solution, the final designs were restricted in size and complexity. I chose to focus most effort on what I found to be a tricky mechanical interaction between body sections. The focus areas were also chosen for suitability as a physical platform for functionality in future designs. Most of it derives from a concept of mine from 2007 that joins the chest and shoulders in a sort of utility vest, which was created for a mountaineering equipment design project. That expedition gear located a power source and wide-angle camera on the chest and multi-spectral stereo cameras on the shoulders. To generate aligned binocular vision (and extract 3D data) the relative position of the cameras must be exactly known, so the mechanical connection provides angular feedback in addition to stabilizing the platform. The motions of the clavicles and shoulder cuff are interesting, as it is one of the more visibly mechanical parts of the body. To transmit force around such a complicated joint would be an interesting challenge. 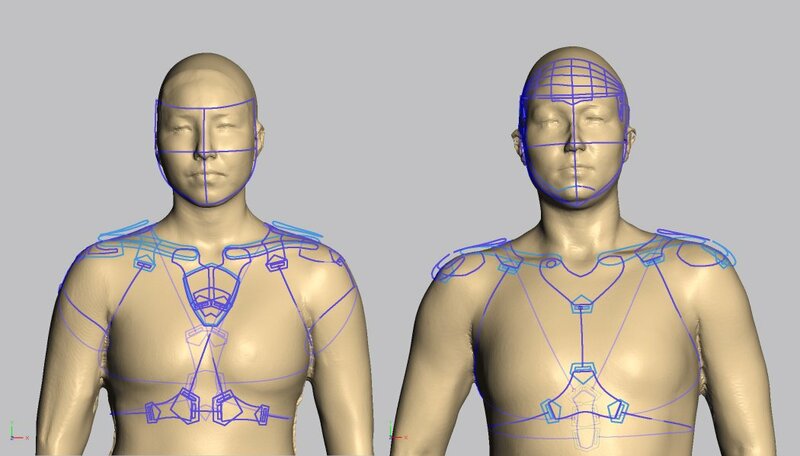 Another plus with this configuration is that I find the area of the chest just below the clavicles to be an excellent site for a technology platform (electronics could be placed there without interference). This area is normally fairly flat, forward-facing and close to the bodies center of mass, so a complete understanding of any potential interference (contact with limbs, etc.) would be beneficial for future work. Eventually the scope of the design was limited to meeting a set of requirements where each piece which must be firmly attached, yet also float gently over the body (distribute any pressure evenly) and adapt easily. It is a common assumption by people who have never worn a custom fit, printed garment that it would be uncomfortable, because we are familiar with form-fitting cloth garments that must use pressure to distort the fabric around curves. In the case of these garments, the pressure is so slight and evenly distributed, that it is actually often literally floating above the skin in many places. Perpendicular movement directions necessitated the use of multiply layers to achieve the needed articulation without passing off too much onto the elasticity of the joinery, which I believe would be a bit of a cheat. It would be easy to simply put on a body suit and glue/sew separate parts to it, but the point of the project here is to address the whole raft of issues that arises when having even a small number of rigid mechanical connections over the surface of the body. With 3D printing one is tempted to rely on the “slop” (looseness) in the 3D printed hinges to give a fudge-factor, but in the end product illustrated by this concept, very fine tolerances would be needed to accurately locate the shoulder positions, and this information is needed to process the shoulder sensor data (to build a 3D image). We are familiar with science fiction, where powered mechanical suits are very thin and each piece seems to have unlimited relative motion (since it isn’t actually attached). In this project emphasis was on directly addressing the issues of structure for functional reasons. In early January, before the team was back on Campus for scanning, a complete prototype design was built over data from a non-gymnast performer with a similar body type. This gave a lot of information about part count, volume, and other things I need to know to break down the project into stages that could be analyzed. Multiplying that times the number of performers, the reduced complexity outfits were predicted to need about 300 hours of work, mostly in printing and finishing. The first week of January was already over, and the show was set for February 12th. I also had several pieces planned for the gallery at 3D Print Show, including two new mannequins, one featuring a new design that was only half done at that stage. Since that all worked out to another 150 hours, I was beginning to sweat a bit. By identifying the dependencies between critical elements, creating backups and alternative implementations, and prioritizing the many “nice-to-have” features, a robust plan was developed that could survive virtually any challenge. Because of the number of parts, total volume, and requirement for last minute changes, I went with extrusion printing for production. This also allowed me to use multiple suppliers for redundancy and faster execution. About half the parts were printed from ABS plastic on a Stratasys Uprint, and the rest on an Ultimaker-based system using PLA. All parts were to be given a metallic finish as a nod to the titanium of the original concept. Printing was going well until about ten days before, the Stratasys broke down [edit: actually this was previously scheduled repair/calibration I was not aware of, but the replacements for the worn parts were not on site, leading to a 3-day delay). This happened at the worst possible time, and Stratasys must be fixed by a licensed tech. Our guy in Massachusetts drove down and repaired it, but it wasn’t looking good for scheduling all these parts with less than a week to go. Once we were back up and running, by some amazing coincidence a cooling fan burned out and printing again came to a halt. To his credit, the technician from Massachusetts drove down on a Saturday to come fix it again. Thank goodness, as the only other options would have added thousands of dollars to an already sprawling budget. Sanding, priming, and painting 3D prints is a lot of work. Fortunately I had two assistants, both industrial design students, to help. Everything was scheduled so tightly that we had to drop one round of sanding and accelerate curing of the finish with heat (carefully, to avoiding melting the parts). The PLA parts also required a coating of epoxy, since they had a very sparse fill pattern and thin walls. After sanding they had many small holes and need some build-up for strength and finish. They were still not cured with mild heating, since normally they would sit for a week. I had to top coat less than 12 hours before assembly, leaving the finish very delicate during the assembly process. For the final lineup we settled on a team of five, with one backup. 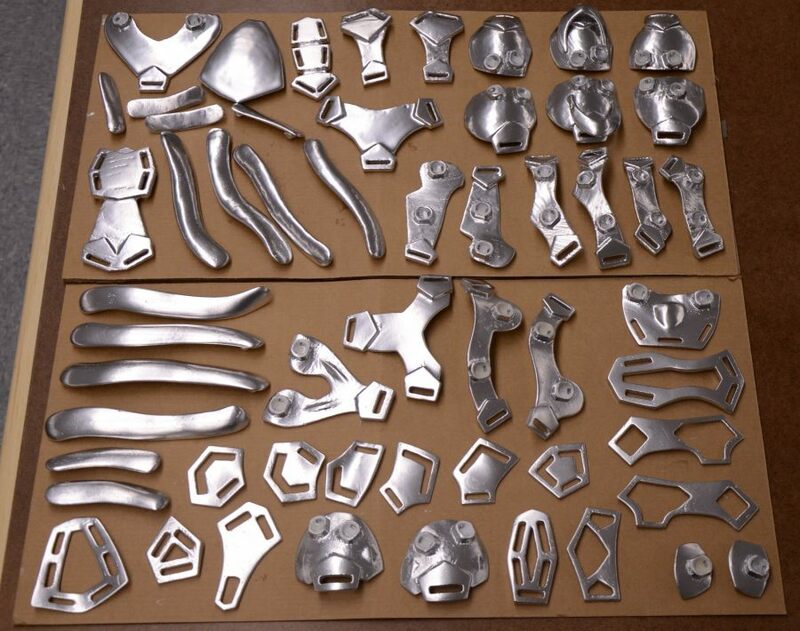 There were about 60 parts in the final set, and while some were similar between outfits, they are all uniquely customized, so a lot of attention had to be paid to keeping them in order, not switching them or installing them backwards. I did a quick dress rehearsal with one completed outfit to get a feel for what kind of tolerances to use on the straps, and to test the joinery and motion of the garment. The length of each strap and cord was calculated from the model, and shortened by 20% to pre-tension the strap. The dress rehearsal gave approximate values, but each joint has different requirements, and I had no way of testing until I actually put them on the performers. I could have assembled and tested the outfits, disassembled them for finishing, then re-assembled them, but that test would have required many more hours and possibly prevented the parts from being finished. If a part could benefit from a change, there was no time to modify, re-print, and finish the replacement anyway. In the days leading up to the show, I was struggling to catch up after all the lost printing time. Due to the timing of the completion of the builds, the only solution was to make sure the parts were immediately removed and sent to processing while the next parts were started, which meant being there at all kinds of odd hours and several all-nighters. In the model shop at the University of Bridgeport, six work areas were set up with each outfit and renderings of the final design. The paint room had one mannequin being refinished, one in final stages of Bondo work, and in the furniture lab one mannequin was still a stack of raw cardboard slices needing to be laminated together. The outfits for those mannequins were also being refinished and having their elastic components replaced. In addition to all that activity, I had another designer with me who I was helping with the finishing of another elaborate 3D printed design, also for the 3D Print Show. On the morning of the show I took the train to NY with the team. The backstage area of the fashion show was the most beautiful sort of chaos, and exactly why I love doing this sort of thing. All these models, bless them, were tasked with displaying items that were more often wearable sculptures rather than any sort of clothing, and most designs were not ergonomic to say the least. I got the feeling many of the pieces had never been worn before. Some designers were present to see through the presentation of their work, but in some cases the pieces never made it into the show, or were not shown as intended. Some designers though, went the extra mile to ensure the show went off without a hitch, helpfully applying their experience to sort out last minute issues. Julian Hakes in particular took extra effort to repair some broken pieces. I lent him some adhesive to fix the heel of a serpentine shoe, and it was only later I learned it was not his design, but he diligently asked around the whole place trying to find a solution. My hands were very full, since the final assembly of the outfits was done on-body. I was fairly calm and focused by that time though, since there wasn’t any mental bandwidth left for anything else. The first run of the performance was for the press. The knights did a great job, sailing through the air with ease, inches from the spectators on either side. There was mention of a dance performance on the website in the lead-up to the show, but it would have been nice to have someone MC the event and explain who we were and what we were doing, since the crowd was mostly fashion editors, and they have very narrow views of what constitutes a fashion show. These viewers of fashion shows are normally there to analyze styles that will influence buyers for the next season. As opposed to illustrating a trend, this show, and especially the Knights performance, would be better described as performance art with “fashion in the future” as a theme. The second performance also went off without a hitch. The girls hit all their choreographic cues, and every connection on every outfit held together for the duration. When someone says 3D printing nowadays, they’re almost certainly referring to desktop extrusion printing of a single material, usually PLA or ABS. I recently did some technical edits for a book on 3D printing, and was surprised to see that this idea is so deeply ingrained in media and culture. One of the points I emphasize in my 3D printing classes is that most of the weight put into this perspective is due to the marketing from companies trying to push printers or filament. As a consultant that puts me in an odd position when dealing with the consequences. Additive manufacturing has great potential, but it is important not to make statements that lead to false conclusions. Media and marketing often strive to present things with just the right level of evasion that will allow them to avoid taking responsibility for the confusion they create. The purpose of this post is to put, in a nutshell, the most important information that printer companies are not excited to tell you, but are essential to make a proper decision. 1.) Books about printing already assume you have decided to buy a printer, so look at other options first. In reality you need to look at the size, material, and number of things you’d like to print. Home printing can be fair quality, but if you value your time your are probably not going to see a return on your investment unless you print several object per week for a year or so. 2.) Home printers are great for education, but not mission-critical business applications. DIY printers are designed to be inexpensive and repairable at home. Every business I know using a home model for continuous production has at least two, and a technician to operate and repair. If the printer is in regular operation, this is a busy job, since each printer has an “up-time” of about 60-90%. They are great in a support role for larger machines. When the industrial systems are occupied, inexpensive satellite machines are great for test prints and radically increase efficiency. Most small businesses I see using a single small machine have it sitting cold, for whatever reason, about 90% of the time. 3.) Single extrusion is limited. You can print anything…that doesn’t have an overhang more than about 45 degrees from vertical. Extrusion printers must always print on something, either a base plate or plastic on a previous layer. Many times it just isn’t possible to orient a design to print well. An unsupported section can lead to distortion, bad surface finish, or even a crashed build where your output looks like a pile of plastic spaghetti. Using auto-generated support mars the finish is labor intensive. Sharp tools are often used to remove support, making this method unsuitable for children. Dual extruder machines often use a soluble support material that eliminates these problems. In fact, while it can waste some material, I have had great luck with stacked builds using these machines. One single build can output dozens of parts, saving tons of labor and set-up time. 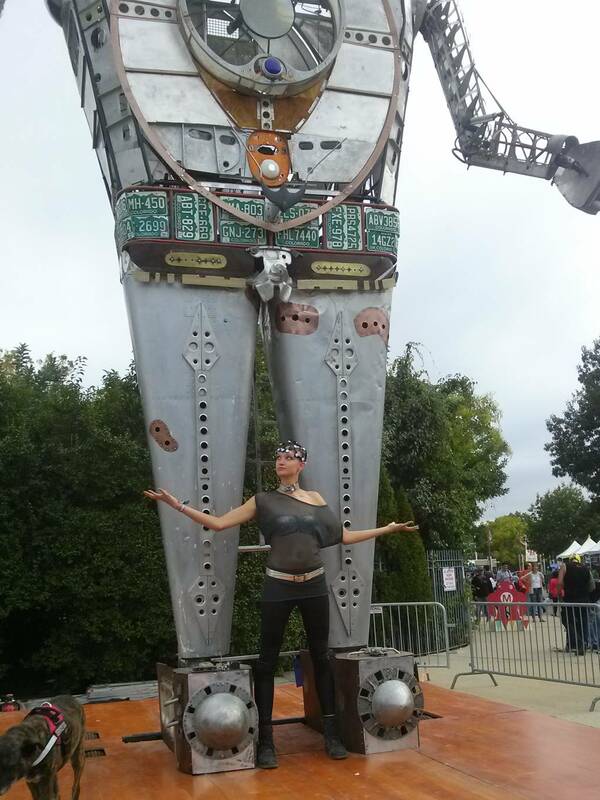 The 6″x8″x6″ build shown at the start of the article contains all the parts for an entire 3D printed outfit (she’s a petite 4’10, 93lbs). To lay out and print the parts individually would have taken at least five overnight builds. The above stack was printed in about 40 hours. The pieces were roughly separated afterward to accelerate the chemical support removal process, so the whole job was done in 48 hours. Laser sintering works this way as well, with stacked builds being the norm, but easier cleaning (support is powder, removed with compressed air instead of chemicals). 4.) Outsourcing is usually easier. How many parts are you printing, how large are they? If your answers are “many”, and “small to medium”, do it with extrusion. If it’s a one-off project or cannot fit on a printer you might consider a composite of many prints, but accuracy will be low and labor high, so this is really only a solution if it must be done on a very limited budget. Desktop extrusion can be outsourced, too. Printer networks like 3D hubs enable you to connect with anyone in your neighborhood with a printer, and at $0.25 per cc, they make the creation of small but bulky parts very affordable. Note that by “bulk” I am speaking of overall density and the proportion of volume to surface area. Extrusion has a sweet spot in the middle. Beyond a certain size, outsourcing can overcharge for thick parts because they charge for the space inside, which is often sparsely filled. If you have deal with an individual, try to negotiate pricing based on material and print time. I use extrusion printing all the time, and it is convenient to have a machine at home if you have the time and space to deal with it. Its great to wake up in the morning and having the part you modeled last night ready to go without missing a beat. If you want that feeling several times a week, or if you just want to tinker with the machine itself, DIY is the way to go. If you don’t have a clear idea of what you would make, and especially if you have not yet developed your modeling skills to make whatever you think of, I’d strongly suggest looking at other options – even other manufacturing methods – that might be better suited to your use and lifestyle. [Edit – July 2015 – 3D Systems has now released a water-soluble filament for home printing. This type of material has been a challenge to create because home printers are not typically enclosed, making it hard to control the temperature, and therefore expansion, of the two different materials (build and soluble support). Another limitation was the caustic chemicals required. Makerbot has been selling a material that was soluble in limonene (that orange-smelling cleaning solvent), but hadn’t been marketing it loudly since it was tricky to work with. The new “Infinity” material apparently needs only regular water and washes away in about 15 minutes! A huge change from the 10-hour cleanings that have been standard.